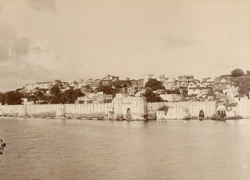 View of Udaipur from the 'Reading Collection: Views of Udaipur taken by an unknown photographer c.1910. The photograph is part of an album containing architectural and topographical views of sites in Rajasthan, mainly of Udaipur, originally in the collection of Rufus Daniel Isaacs, Lord Reading, who served as Viceroy of India (1921-1926). Udaipur was chosen by Maharana Udai Singh (r. 1567-72) of the Sisodia Rajputs as the new capital of the Mewar State in the mid-16th century. This is a general view looking across Lake Pichola towards the rooftops of the city, which are enclosed by a high crenellated wall with a water-gate between two towers at right.